When I was a little girl I loved giving and receiving Valentines, and I suppose it's fair to say that I've never outgrown it! It is so much fun to have a stash of little cards to draw from for whenever and wherever a little love note would warm someone's heart. 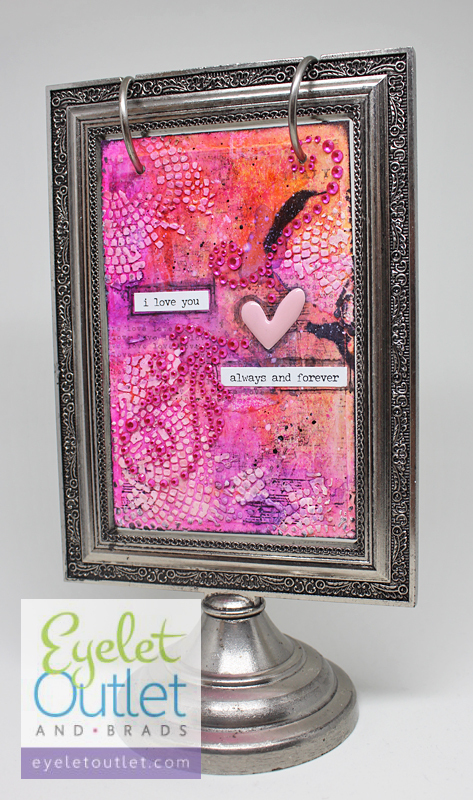 These ATC-sized Valentines come together so quickly using coordinating papers and Eyelet Outlet embellishments. 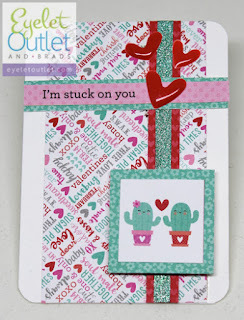 One might expect to see enamel hearts and glitter washi tape on a Valentine, but with the right sentiments, other everyday objects will work just as well. How about "a perfect pair" of eyeglasses? Maybe a white and pink iPhone from our set of Selfies brads?! 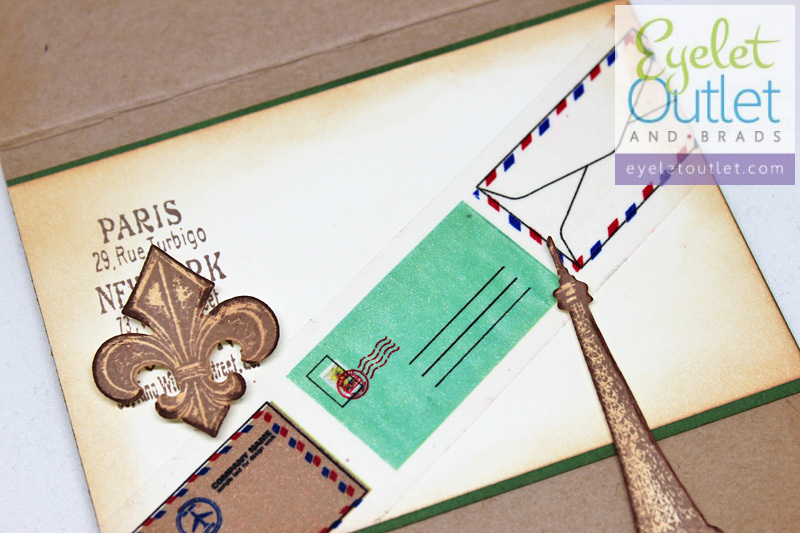 This set of ATCs was made from bright, clean white card stock, but I'm working on some with vintage papers and embellishments, too. A few scraps of paper and you're halfway there! 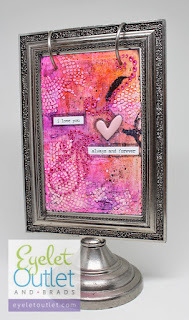 You can use the ATCs as they are, or as a jump-start for a regular card, and they are a great place to try a new technique. Have fun experimenting! Happy Wednesday, everyone! I've been having a blast playing around with map and atlas images and some of the new mixed media "toys" that I got for Christmas. Truth be told, I had made my friend a gift using a frame from Michaels, and loved the way it turned out so much that I went right back to get one for myself (at 50% off, too)! I don't have many decorations for Valentine's Day so I made a colorful collage that started with a black and white map of Italy and some "love" designer paper. 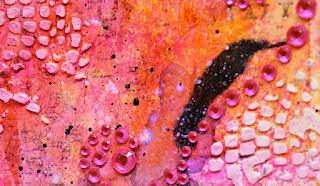 I used water-based paints, inks and sprays to add bright pink and vivid orange, then layered stamps and inks, stencils and whipped spackle. If you look closely, you can see the Italy label in the upper corner, and the faint array of cities hidden under the layers of color and texture. 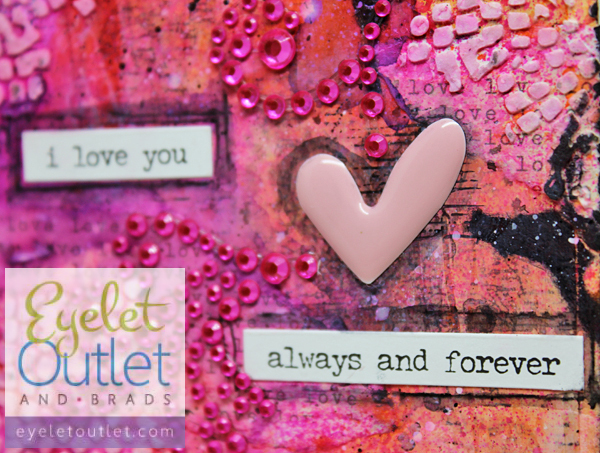 Beautiful bright pink jewels lead the eye through the details of the collage, swirling around the word Italy in the upper right corner, framing the sentiments and pink enamel heart that form the focal point of the piece. A little smudged ink helps them to stand out from the busy-ness of the background. I love that the map and mosaic patterns of this piece remind me of our trip last year, reminiscent of the tiles of so many of the streets and structures we visited. The frame that I gave my friend held two collage pieces that formed the front and back covers of a suspended photo album, and I'm tempted to do the same, although I think this will most likely become another one of those decor items with interchangeable inserts for each holiday to go along with my library card drawer. I'd love that! I have always been drawn to images of France and the Eiffel Tower! 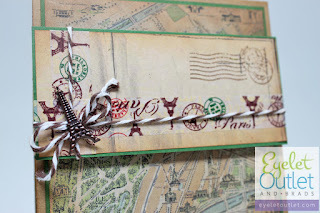 I found some pretty designer paper with a map of Paris and thought that it would make a nice masculine non-traditional Valentine for my husband. As a young Navy wife I took a plane to Marseille to meet him when the aircraft carrier pulled into port, and we took the bullet train up to Paris for a whirlwind, romantic trip. We even stayed in the turret of a castle in Rambouillet! I love that this card will have special significance for him and bring warm memories to mind. 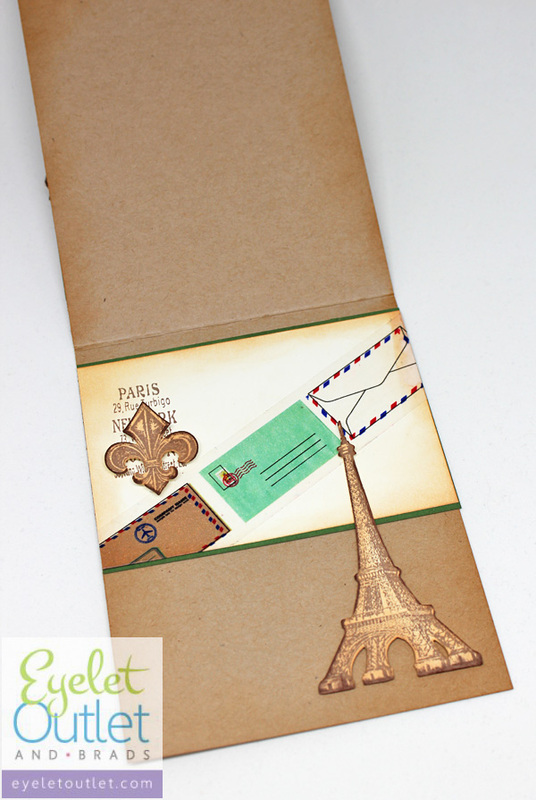 The front of the card features our Paris washi tape and a bronze Eiffel Tower brad. 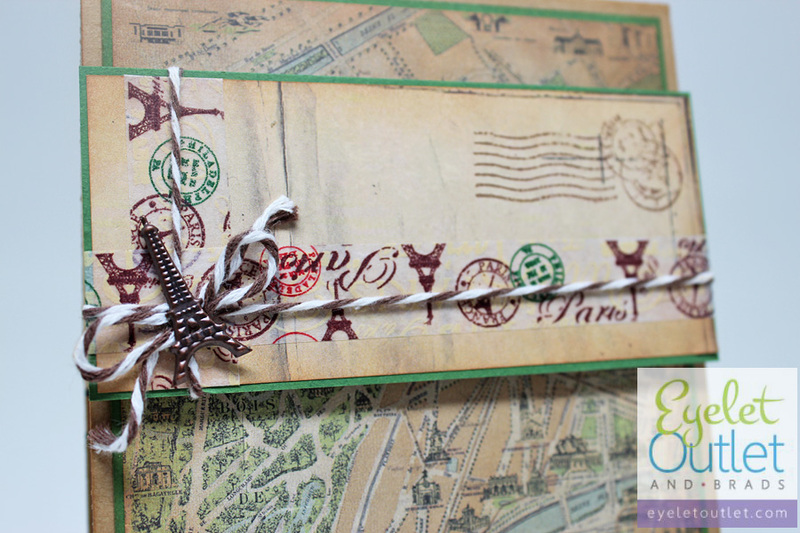 The stamp set that I used included vintage postage marks, so the tape and twine give the card the feel of a parcel. To carry the theme and colors to the inside, I added a strip of mail washi tape along with a fleur de lis and a larger, die-cut image of the Eiffel Tower. 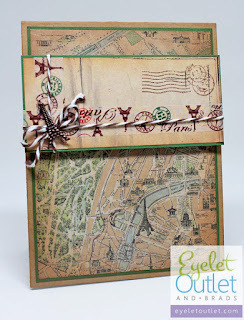 Fun and not too frou frou! I think he'll like it! I have another more traditional Valentine project planned for my next post! Hope to see you then! Hello and warm wishes for a Happy New Year! Do you make resolutions? One of mine for the upcoming year is to be more intentional about spending time with my friends. 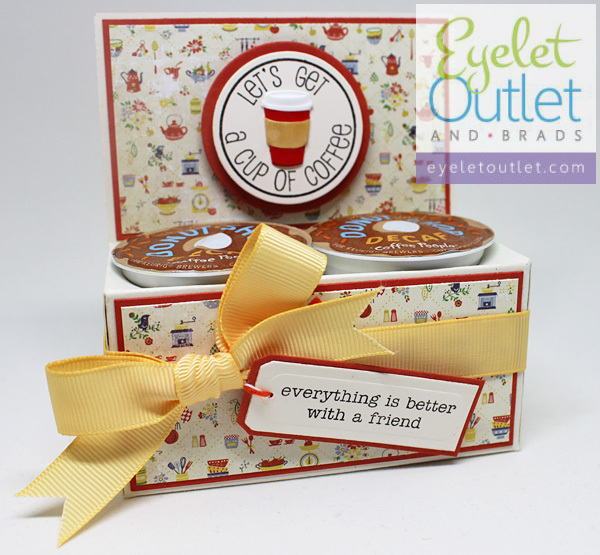 It's great to slow down for a little while and just enjoy being together over a cup of coffee or tea, to catch up and maybe make more plans! 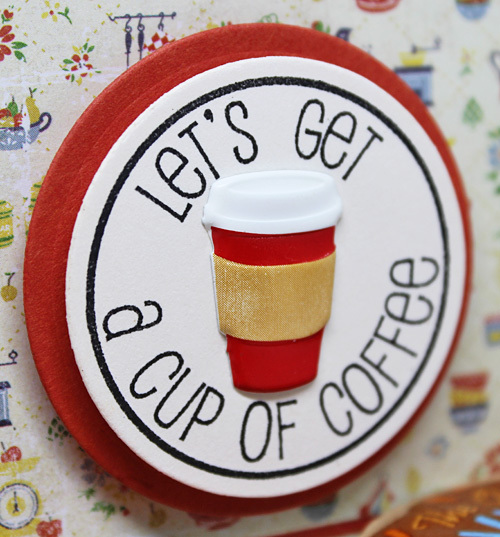 It's especially fun if there's crafting involved! My friend Lori Tecler designed the template for this cute K-cup holder which makes the perfect backdrop for our new coffee brads. 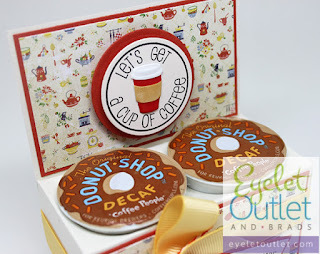 They're so cute and they make an adorable focal point, even on a super simple layout! 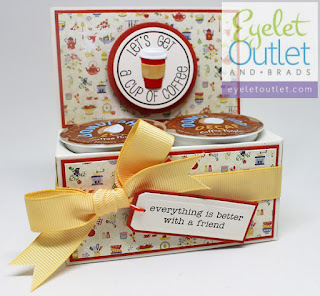 It's true, everything is better with a friend! Make a date to take care of your friend while you simultaneously nurture your own spirit! Enjoy!